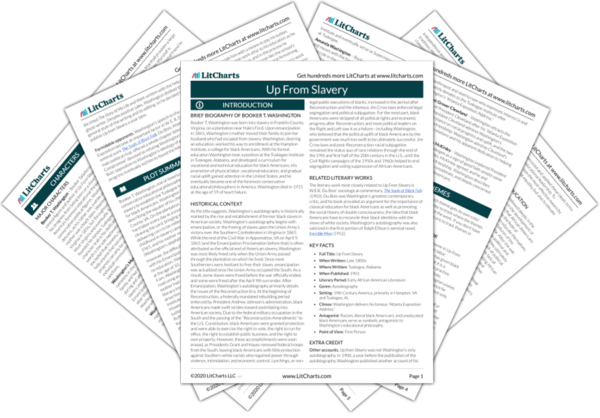 Instant downloads of all 946 LitChart PDFs (including Up From Slavery). 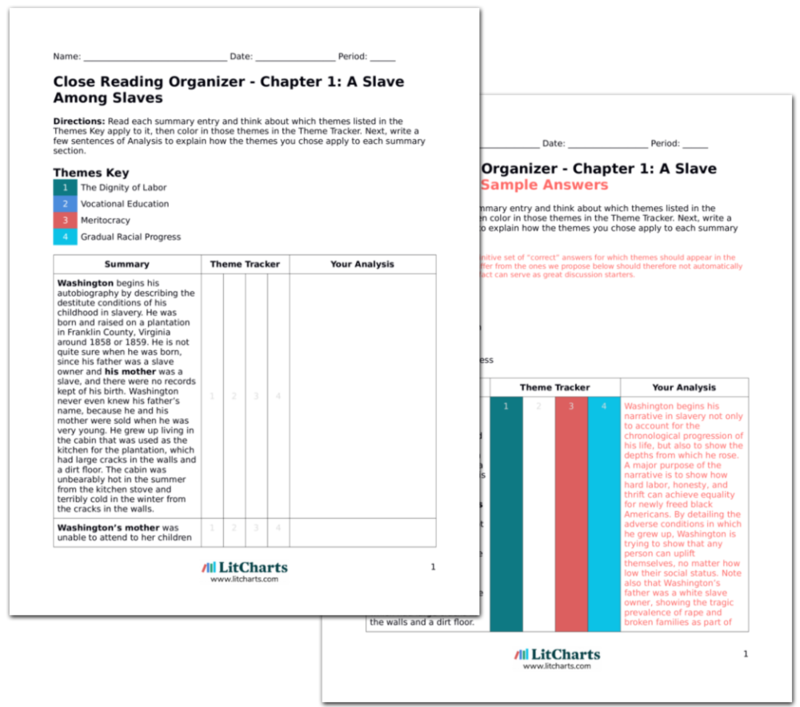 LitCharts assigns a color and icon to each theme in Up From Slavery, which you can use to track the themes throughout the work. In May of 1881, a transformational opportunity was presented to Washington. One night after Hampton’s chapel, General Armstrong approached Washington about a letter that he had received from Alabama asking for recommendations for a principal to lead a new “colored” school in the town of Tuskegee. Although the men expected Armstrong to recommend a white man, he approached Washington about the position. Washington gladly accepted and waited to see if the men would accept a black man for the job. Washington explicitly mentions that the people in Tuskegee were looking for a white man, thus highlighting his belief that his merit erased whatever racial prejudices the search committee had in their qualifications for a new teacher. After waiting several days, Armstrong received a telegram accepting Washington as the new principal. Washington and the faculty, students, and staff of Hampton were elated, and he immediately began to prepare to move to Tuskegee. He spent a small amount of time in his home town of Malden, and then made the journey down to Alabama. Another recurring event in Washington’s narrative is the community celebration of individual success. Washington always includes the celebration of his accomplishments by his community, to show that the community valued his hard work and recognized the uplifting power of his merit. Washington found Tuskegee to be a small town of about 2,000 people, of which about one half were black. In the county around Tuskegee, black people outnumbered white people by three to one. Washington mentions that Tuskegee is in the “Black Belt,” which he defines as the geographical region distinguished by both the color of the soil and the large black population brought there by slavery. “Black Belt” is a relatively contested term in geographical and sociological circles. Some people argue that the term only refers to the color of the fertile soil of the area. However, because of the region’s agricultural fertility, many slaves were sold to this area of the country to work the land. Thus others feel that “Black Belt” is a racially charged term to describe this region. As a result, the term has adopted a sort of a double meaning. Washington felt that Tuskegee was an ideal place for the school. It had a large black population that was “ignorant,” but had not fallen to the vices of people in the lower classes of large cities. The white people of the town were also more cultured than most Southern whites, because the town was once a center for white education. Because of this, Washington found race relations to be relatively peaceful in the town. Tuskegee’s largest business, the hardware store, was even jointly owned by a black man and a white man. Washington deeply admires the white Southerners in and around Tuskegee, and he highlights their “cultured” nature to show that not all Southern white people are racist and vicious. Of course, he also sets a rather low moral bar for white Southerners in this case, but that’s because racism in the South at the time is so prevalent that it’s usually assumed. Washington learned that the people of Tuskegee had asked the state legislature for some money to educate themselves, and the legislature had granted $2,000 as a yearly educational supplement. However, the money could only be used to pay teacher salaries, so it could not be applied to school materials, land, or buildings. Although Washington felt that the task of actually starting a school seemed impossible, the black people in the town were very encouraging and supportive. Monetary issues re-enter Washington’s narrative here, and they will continue to plague Tuskegee until after Washington’s Atlanta Exposition Address many years later. Washington is also highlighting that black Americans deeply value education and are supportive of his endeavor. Washington’s first priority was to find land on which to open the school. He found a small shack near the black Methodist church in town, and he immediately began teaching there. The building was in such poor shape that if it rained during the school day, an older student would have to put down his lessons in order to hold an umbrella over Washington so that he could continue teaching. Washington includes the details about the dilapidated nature of the building in order to highlight how exponential Tuskegee’s growth was. Washington wants to show that labor can create an entire institution from a broken down shanty. The people of the town of Tuskegee were deeply interested in political matters, and they wanted to ensure that Washington was one of them politically. One man who was put in charge of this task asked Washington to vote how they voted, which was always the opposite of the white men in the town. However, Washington felt that this type of practice was misguided, and he is happy to report that the practice is diminishing in the area as he is writing. He believes that voting from “principle” is the only way to vote. As already discussed, Washington was rather conservative in his political ideology. He believed that it was foolish for black Americans to vote based on their racial interests, and rather black Americans should simply vote based on the merit of the candidates. The first month that Washington spent at Tuskegee, in June of 1881, was spent traveling through Alabama to observe the actual life of black Americans in the state as well as to advertise his school. Washington relished this opportunity to engage with the real and everyday life of the people. Wherever Washington travels, he attempts to see the “actual” life of the people. Since his educational philosophy highlights meeting needs as they occur in the community, he feels that it is very important to engage with that community before developing a curriculum. In the plantation districts, Washington found that most families slept in one room, and that there was no place to bathe in most of the houses. Most families also survived off of fat pork and corn bread, and despite the rich soil around them that could have supported many crops, Washington observed that they only planted cotton, sometimes so much cotton that it went right up to the door steps. The cabins also usually had one expensive item, often a sewing machine or a clock, that the inhabitants would buy on credit and pay back in monthly installments despite the family’s meager income. One family even had purchased an organ, but only had one fork, which the entire family had to pass around and share. Like in his discussion of the homespun cap that his mother made him in his childhood, Washington feels that material items are of no use if people lack morals and merit. Washington was shocked by what he saw as the backward priorities of some of these families. He thought that many of their practices were wasteful and thriftless, which in his eyes contributed to their poverty. This is a very limited view (as it ignores the fact that labor doesn’t make everyone happy, and sometimes these “extravagances” do), but it fits with Washington’s general ideology. Although Washington was regularly treated with the hospitality of a sit down dinner, this was not regular protocol for the families in the plantation district. Often at the homes he visited the wife would get up and cook breakfast in a skillet, and the husband would pick up his breakfast and walk to the fields while the children would eat directly out of the skillet or eat while running around in the yard. After this, the whole family would proceed to the cotton field, and the later meals were taken in the same way. Washington felt very strongly that black families should emulate the practices of upper class white families. He wanted black families to sit down to dinner together at the same time each day with a properly set table, to foster organization in the household. This type of schedule was repeated daily, except for on Saturday and Sunday. Saturday the family would go to town to “shop,” and although they had little to no money, they would spend the entire day in town, sitting around or talking with the other families. Sunday was spent in church. Like other family practices that Washington observed, he felt that these weekend practices were wasteful and contributed to poverty. As for the rural schools, Washington found that they were all in disrepair. The black communities were largely in debt and the state provided no money for education, so the schoolhouses were in shambles. Most did not even have means by which to heat the school in the winter. Many of the teachers were also ill prepared. Because of these abysmal conditions, the schools were only open for 3-5 months per year. Washington also states that the churches and ministers were in a much similar condition to the schools and teachers. The lack of state subsidized education in the South was a big issue for many black Americans in the South after the Civil War. Without access to free public schools, black Americans had little chance to educate themselves and achieve economic independence. Washington recognized this and knew that education needed funding to succeed. While Washington feels that the conditions of rural Alabama were abysmal, he both recognizes the cause of these conditions and states that some people in this region provided “encouraging exceptions.” He tells the story of one man who was sold to Alabama from Virginia during slavery. When asked how many were sold with him, the man replied “myself and brother and three mules.” Washington claims that his purpose in describing the struggling families of rural Alabama is to show the depths from which the region rose with the help of the Tuskegee Institute. This story by Washington demonstrates the mental effects that slavery had on many newly freed black Americans. 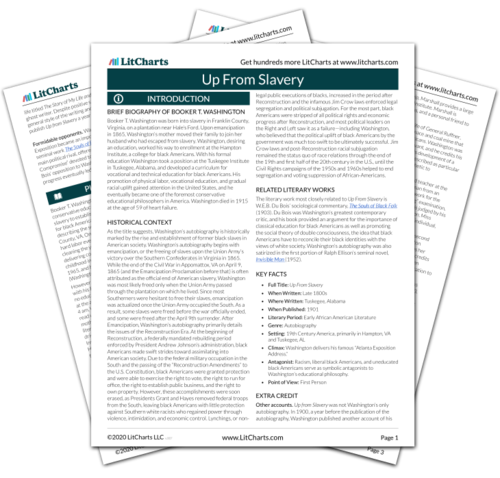 Since they were considered chattel, or property, during slavery, many people internalized such views and struggled to uplift themselves socially or economically. Bunzey, Tyler. "Up From Slavery Chapter 7: Early Days at Tuskegee." LitCharts. LitCharts LLC, 7 Sep 2017. Web. 24 Apr 2019. Bunzey, Tyler. "Up From Slavery Chapter 7: Early Days at Tuskegee." LitCharts LLC, September 7, 2017. Retrieved April 24, 2019. https://www.litcharts.com/lit/up-from-slavery/chapter-7-early-days-at-tuskegee.